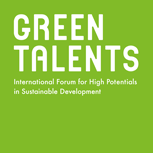 Berlin, 27/10/2017 Today, the 9th “Green Talents – International Forum for High Potentials in Sustainable Development” culminated in a festive award ceremony. Matthias Graf von Kielmansegg, General Director "Policy Issues; Strategy; Digital Transformation" at the BMBF, honoured 25 young scientists from 21 countries. This year´s competition attracted 602 applicants from over 95 countries. For the first time Egypt, Fiji, Iraq, Slovakia, Sweden and Uganda are among the Green Talents winner countries. A high-ranking jury of experts selected the most outstanding ‘green’ visionaries, who come from an impressively wide range of academic research areas with diverse achievements. The awardees were invited to participate in the two-week Science Forum during which they visited top locations for sustainability research in Germany. The extremely varied programme of workshops and events placed a special focus on this year’s motto of “Sustainable Production and Consumption”. The young researchers learned about state-of-the-art approaches and technologies and exchanged ideas with leading experts in individual meetings thereby obtaining a deep insight into Germany’s innovation system and discovering new opportunities for prospective collaborations. Their efforts are supported by the invitation to return to Germany in 2018 for a fully funded research stay at an institution of their choice. In his laudation, Falko Leukhardt from the German Council for Sustainable Development stressed the importance of the Green Talents Programme for future international science cooperation: “I am deeply impressed by the scientific expertise and strong motivation of this year´s 25 Green Talents. Their research is clearly making a contribution to tackling global challenges and I am glad that they will become part of the German research landscape.” Andrea Gutierrez, a Green Talents Winner in 2015, gave an exclusive insight into her experiences after winning the Green Talents Award. She highlighted the fact that Green Talents had given her the opportunity of pursuing a Postdoc fellowship to work at the German Aerospace Center in Stuttgart. Please visit www.greentalents.de for more information about the programme’s background as well as this year’s competition and awardees and follow the posts published on LinkedIn and Twitter.